Hiring an interior designer is always a good idea – they make your home look good and more functional. You can hire an interior designer in case you have invested a lot in your home and you don`t want to do it yourself, or you don’t think that you can do a good job yourself. 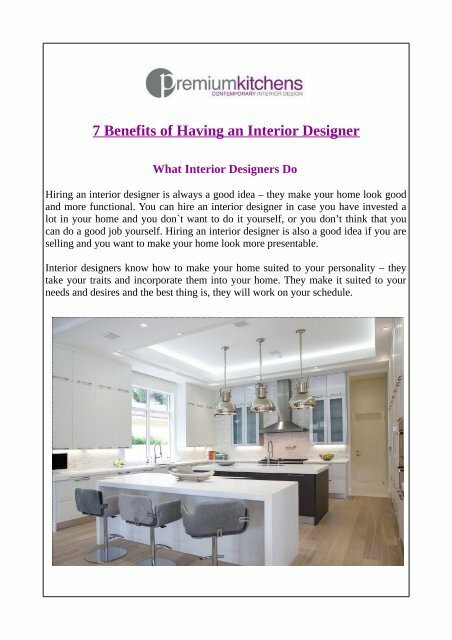 7 Benefits of Having an Interior Designer What Interior Designers Do Hiring an interior designer is always a good idea – they make your home look good and more functional. You can hire an interior designer in case you have invested a lot in your home and you don`t want to do it yourself, or you don’t think that you can do a good job yourself. Hiring an interior designer is also a good idea if you are selling and you want to make your home look more presentable. Interior designers know how to make your home suited to your personality – they take your traits and incorporate them into your home. They make it suited to your needs and desires and the best thing is, they will work on your schedule.